Vitamins and minerals help keep the body healthy and functioning properly, and with a balanced diet, you can typically get the nutrients you need. Zinc is an essential trace mineral that aids in proper bodily functions, and it is easily obtained through dietary sources, including spinach. If you think you may not be getting enough zinc, talk with your doctor about your diet and whether supplementation is necessary. The body doesn't naturally produce zinc; you get it through the foods you eat. Zinc is present in every cell and is the second most common mineral in the body next to iron, states the University of Maryland Medical Center. It aids in vision, immune function, growth, blood clotting, healthy thyroid function and reproduction. It also has antioxidant properties, which help protect cells from free radical damage. This mineral may also be beneficial in helping to treat age-related macular degeneration, acne, sickle cell disease and stomach ulcers. If you are interested in using zinc to treat any medical condition, talk with your doctor to determine if it is safe and appropriate for you. Although a mild zinc deficiency is not worrisome, a significant deficiency can cause serious adverse health effects. Without adequate amounts of zinc, your immune system does not function well, wound healing is delayed and night blindness, hair loss and depression can occur. Your sense or smell or taste can also be affected. People at risk for zinc deficiency include people with absorption problems, such as Crohn's disease or celiac disease; alcoholics; the elderly and those with restricted diets. According to the Office of Dietary Supplements, men ages 19 and older should consume 11 mg or zinc daily, and women in that age group should consume 8 mg daily. Women who are pregnant or breastfeeding should consume a little more; 11 mg and 12 mg, respectively. Male and female teenagers 14 to 18 years old should consume 11 mg and 9 mg, respectively, with pregnant teens needing 12 mg of zinc daily. 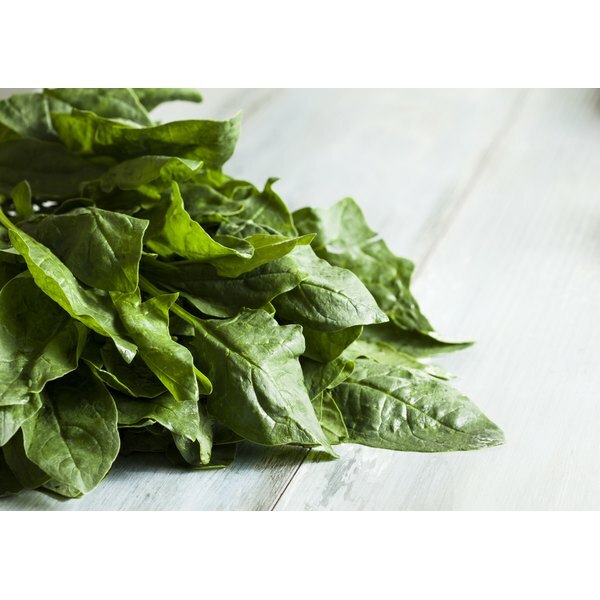 According to the United States Department of Agriculture, 1 cup of raw spinach provides 0.16 mg of zinc. One cup of cooked spinach provides 1.37 mg of zinc. Spinach can easily be incorporated into salads, omelets and added to pizzas. In addition to spinach, other food sources of zince include oysters, red meat, cheese, soybeans and sunflower seeds. Individuals who eat meat likely get adequate amounts of zinc, but if you are a vegetarian, you may want to talk with your doctor about your zinc intake. The Office of Dietary Supplements states that vegetarians may need up to 50 percent more zinc than non-vegetarians, because the zinc in meat is better absorbed by the body than zinc in plant sources like spinach. Supplementation may be necessary. If you are taking supplements, do not take more zinc than recommended, as too much zinc can cause headaches, drowsiness, loss of muscle coordination and impaired immune system functioning.